My dad and I went out scouting for new trees today. I kind of consider myself a treehugger, but when I was out wrapping orange tape around the trunk of large trees, I doubted that particular classification. But then I thought about other sources of heat, such as mining coal or natural gas. And I thought about the only thing that really keeps me warm in the winter-sitting by the fire. We aren’t going out and clear cutting our forest. We have 40 acres of trees, and if we collect firewood carefully, it really is a sustainable operation. Our mission was to find dead standing trees that were suitable for use this year, as well as live trees that we could cut down this year, split next year, and burn the following year. There are so many different elements involved in selectively cutting trees. Things to look for include the texture and type of tree and the location of the tree (closeness to the road and to other trees). It is also important to know if the tree is dead or alive, and whether something is currently living in or eating the tree. We carefully looked at all of these factors with every tree that we banded. 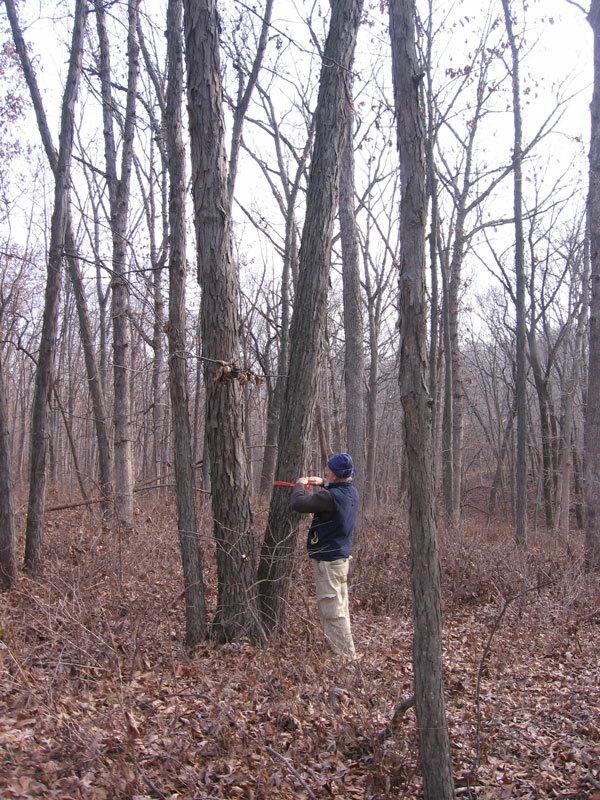 The variety of tree is very important when choosing trees to cut for firewood. Every type of tree has a different character. More ashes, less ashes, higher heat (BTU), easier to light, etc, etc. Some woods even smell better than others, which does actually make a difference. There is a great chart that outlines the specifics on burning different hardwoods on the website Demense. Great if you are collecting or buying firewood. We have been harvesting mostly oak, hickory, and locust. We leave the walnuts, as they have lower BTUs, and create a lot of ash! And if the wood is mostly limb wood it will burn well, but because there is a higher ratio of bark to wood you will get a lot more ash. The limb wood is great for starting a fire though! Looking up to the sky tells a big part of the story. It is important to pick trees that are crowded in, have less of a chance to reach sunlight, and are leaning heavily and or awkwardly. 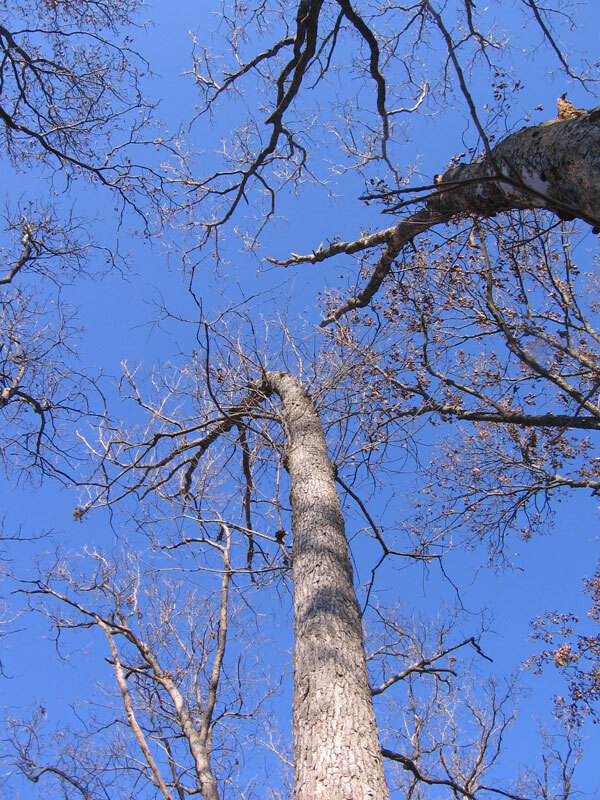 The hickory in the images above and below is leaning significantly to the right. When we cut it, the space will open up for the surrounding trees to grow. According to my dad we are speeding up the clock a little. Taking down trees that are more likely to die sooner anyway. 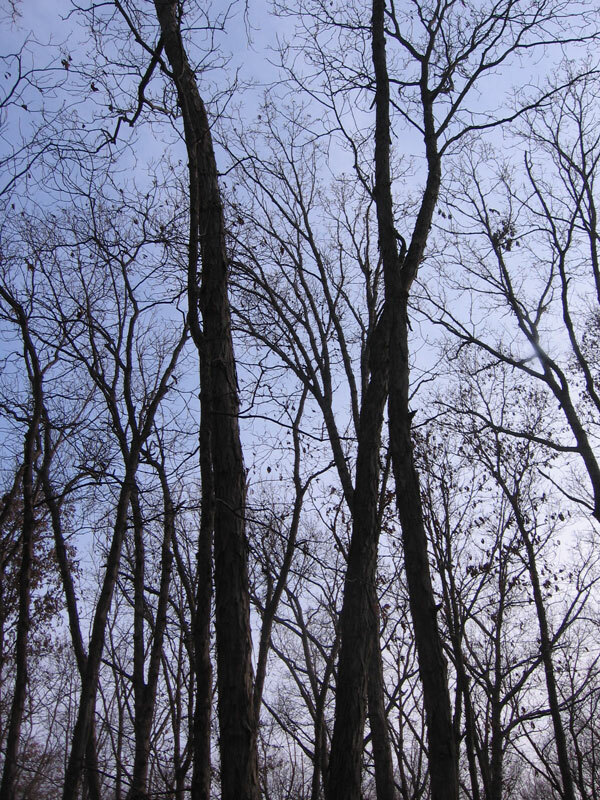 Below is another example of trees that are crowded. 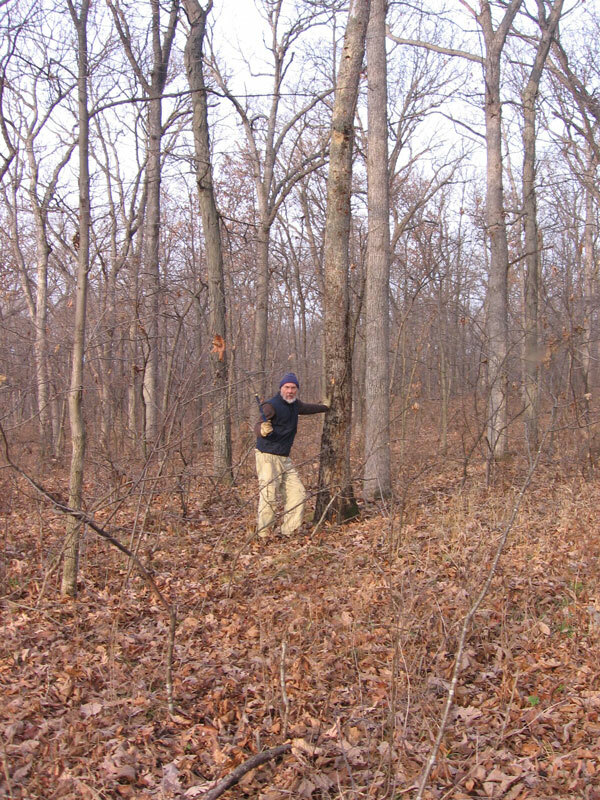 The tree on the bottom of the image below is banded to be cut for future use. It has grown underneath the rest of the trees, and is growing almost sideways at the top. The tree is still alive, but not getting as much sunlight as the surrounding trees. The tree on the right is a dead tree, also banded to be used this fall. Once these trees are removed, the sky will open up, and the surrounding trees will have more of a chance to grow and expand their canopies. Another important factor is the path for the tree to fall. When you chop down a huge tree, there is always a chance that it will take some of the surrounding trees with it. It is better to find a path for the tree to fall that doesn’t wreak major havoc on the surrounding trees. And since we are felling these trees for firewood, it is important to have a good access point for the truck so that we can winch the trees out with relative ease. Back to type of wood. We tested the dead standing trees by chopping away at them with an axe. If they had a nice ring to them, the trees were solid, and good for firewood. 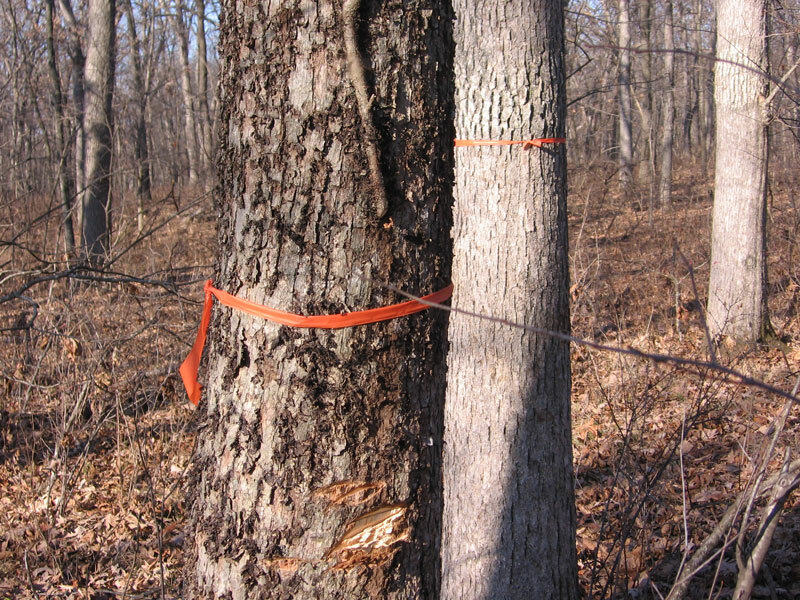 We wrapped these trees with two bands of orange tape to indicate that they were ready for use this fall. (We didn’t start the double wrap until after this tree..) Dead trees are ready to cut, split and use right away. The single band wrap was for trees that are to be cut this year and used later. Trees that are cut alive, or green, take about a year to dry out, and then they are ready to be sliced into rounds and split. It is okay to cut the green wood, but it is difficult to split it because of all the moisture present in the cells. The plan that we have come up with is to cut the tree one year, cut and split it the next, and then burn it the following year. That way the firewood is given a chance to cure, and is great for burning! It is important to leave dead trees for wildlife too. Ants, beetles, birds, squirrels, raccoons, mushrooms, etc. need homes and food too. 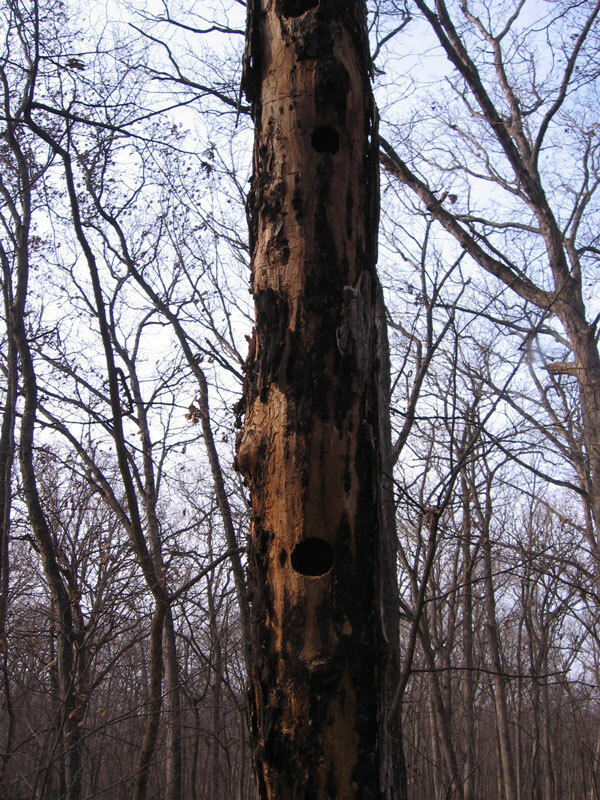 We left rotton trees, or trees that had a lot of evidence of animal life alone. There were some trees up for debate here, but we didn’t end up with too much of a feud (for now anyway). The above tree is home to a whole colony of puffball mushrooms. 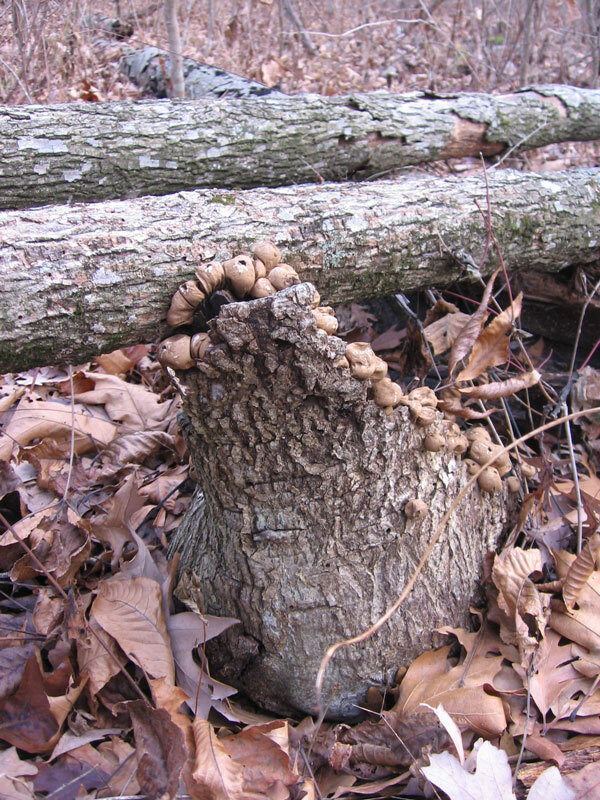 This picture is only one of the stumps in the small area that is covered with puffballs. They seemed to have taken over. All the trees were elm, and I have always looked for morel mushrooms under dead elm trees, so there might be a connection here as well.